On January 28, the Ministry of Interior deposited for public review the plan for the Old City aerial cable car (published in local newspaper). Interested parties now have 60 days to submit any objections to the plan. After this period, a public hearing is to take place, before moving the plan to final approval. 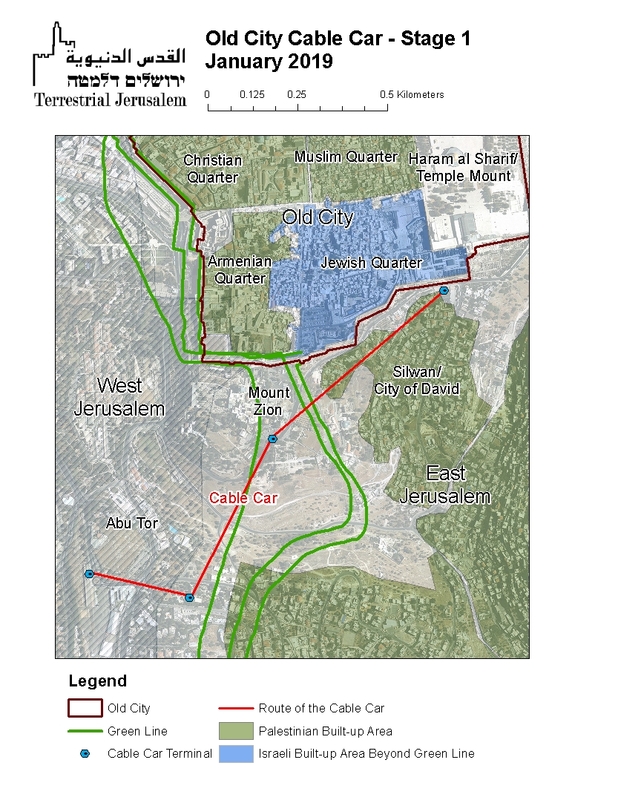 The aerial cable car is to run between Jerusalem’s First Train Station and the Old City’s Dung Gate/the northern entrance to Silwan. As we have written in previous reports, this project is part of the government’s and settlers’ joint efforts to aggressively promote an agenda that seeks to marginalize and to the greatest extent possible over-write the Palestinian presence in Old City and Historic Basin, replacing it with a Biblical-Jewish Disneyland. Both the project itself and the context of its approval - celebrating the “reunification” of the city in a location that is at the core of the tensions between Israel and the Palestinians - are blunt statements that Israel is determined to take ownership over Jerusalem holy sites, in total denial of the sensitive nature of the place for faiths other than the Jewish one.” For details, see our previous reports, here and here. Bigger/downloadable map is available here.